Baby nursery room is the best space for feeding lovely babies with lot of amazing moment and experience together. Series of activities are done here like changing baby’s diaper, showering baby, and even singing her/ him lullabies song. 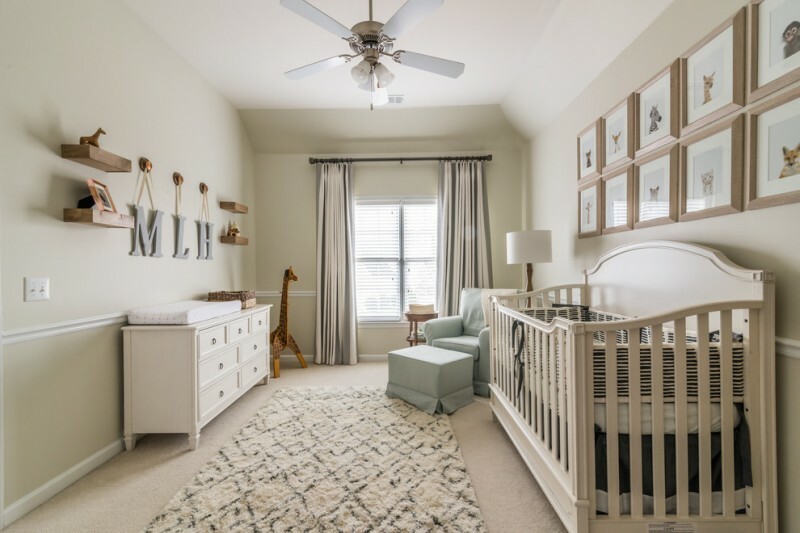 To feel cozier, it’s a must to consider the nursery room design, including the furniture sets and their complementary items. Baby crib, nursery chair, baby dressing, and even rug are important to select as best. Here, there are best tens of rug products specifically designed for nursery rooms. Wish that they will be moms’ inspiration in selecting the best baby rugs for nursery room. Mom needs a cozy space during feeding her baby. Small-sized white shag rug becomes one of best choices to create amount of comfort for both mom and her baby. 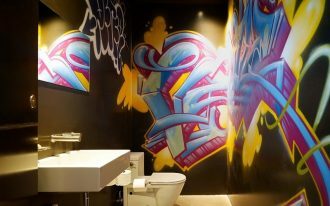 Its color brings clean and it leads us know how sterile the space is. Textured baby rug for nursery is also recommended. It gives you relaxing texture when your steps right it on. Gentle and white rug with blue colored texture has been depicted on this product. Here, we’ve found two different rugs for a nursery, small-sized white shag rug and dark brown carpet with traditional floral motifs. The little one is actually just a decorative ‘layer’ that can warm mom’s steps when she’s putting or taking her baby from the crib. 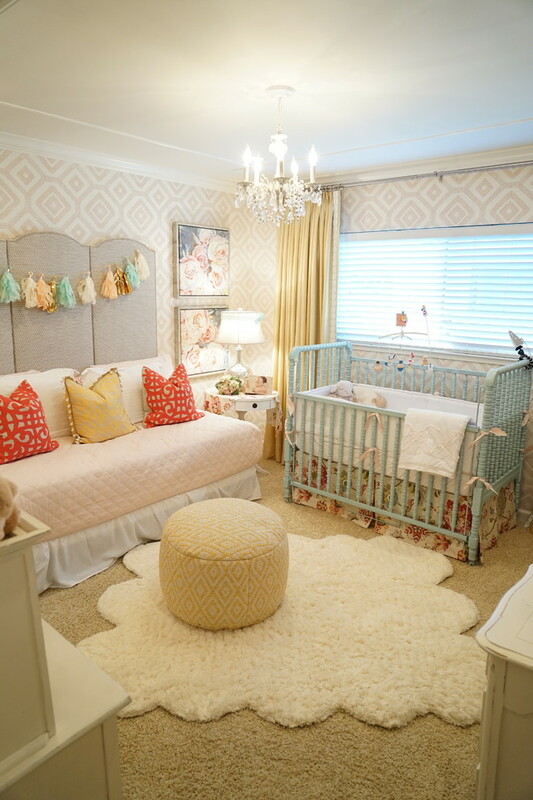 Elegant and cute baby girls’ nursery with soft palette rug. The embroidered rug beautifully softens the grey vintage walls, but contrasts with white nursery chair (with slipcover) and white cotton-knitted pouf. 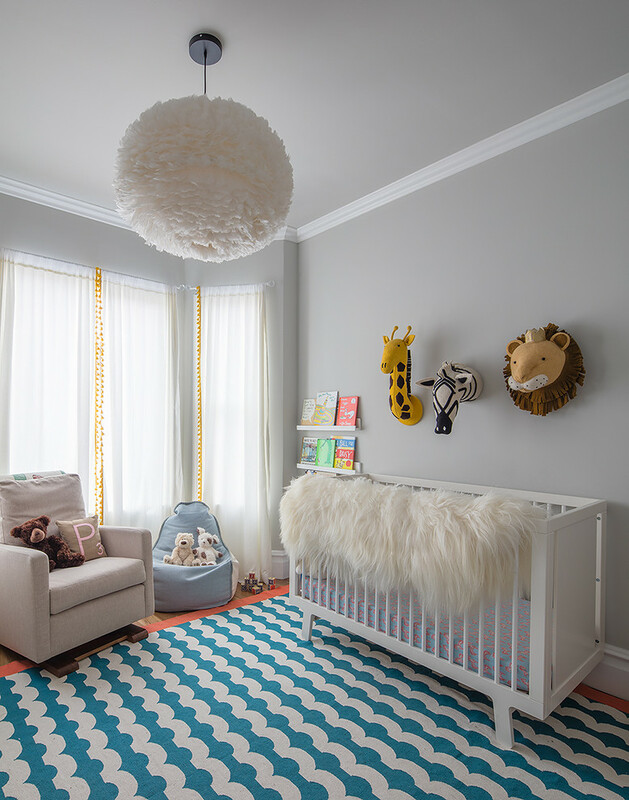 A gender-neutral carpeting idea for a nursery space. White is best choice of carpet/ rug color due to it’s neutral for both girl and boy. 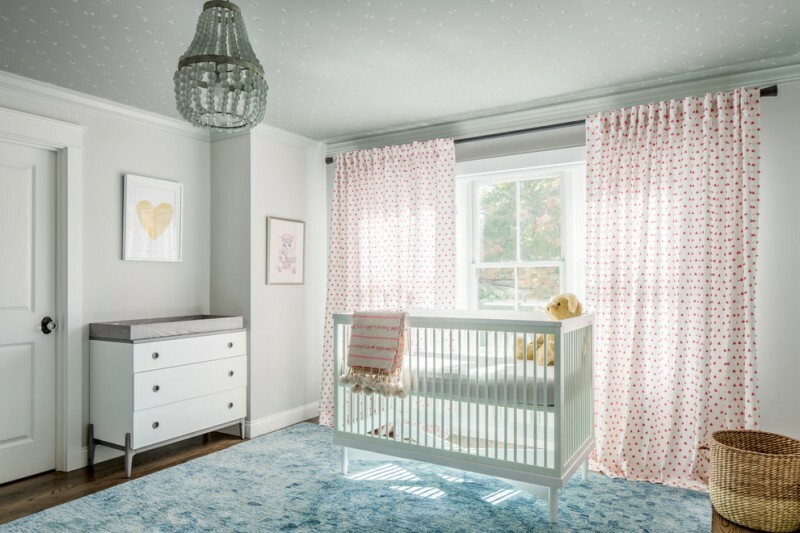 You just need to ornate your nursery with other colors, furniture sets, and accessories that fits feminine of masculine style. Bright yellow dominates here and the space is furnished with clean line and white furniture sets; a nice match for walls. Blush pink rug will make dark & light grey walls and white stand out. This idea is often used by most people who love decorating their nursery in simplest way with a fabulous result. 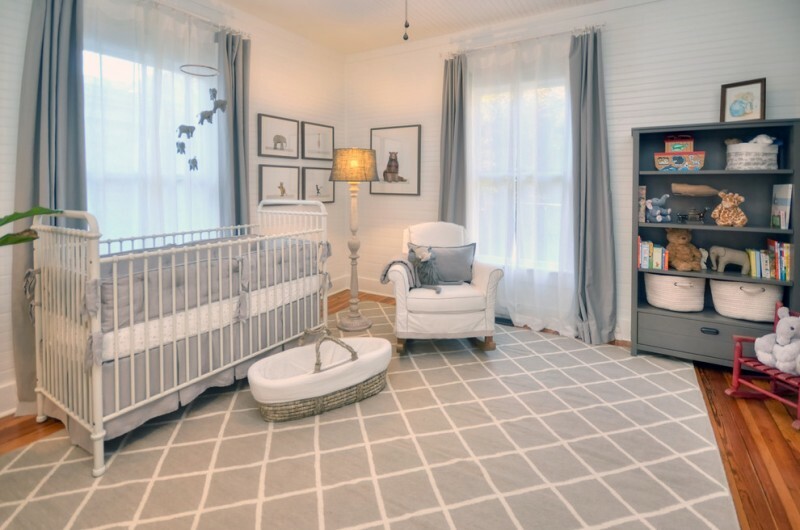 White rug with texture – a nice choice for a nursery. It works well with baby blue accents discovered in a round-top table and window shade. Wood floors seem to be a beautiful contrast for all white elements. Can’t explain what exactly the rug is. At glance, it’s more likely the beach sands but fluffy and gentle. The thickness offers us huge warmth and comfort when they’re using. These values, of course, are really ideal for a nursery or kids’ bedroom. Feature it with light and clean interior items to create softer visual effect in room. Add beach style to your baby nursery by just cover the floors up with such little ‘waves’ rug. Blue and white depict the real waves. 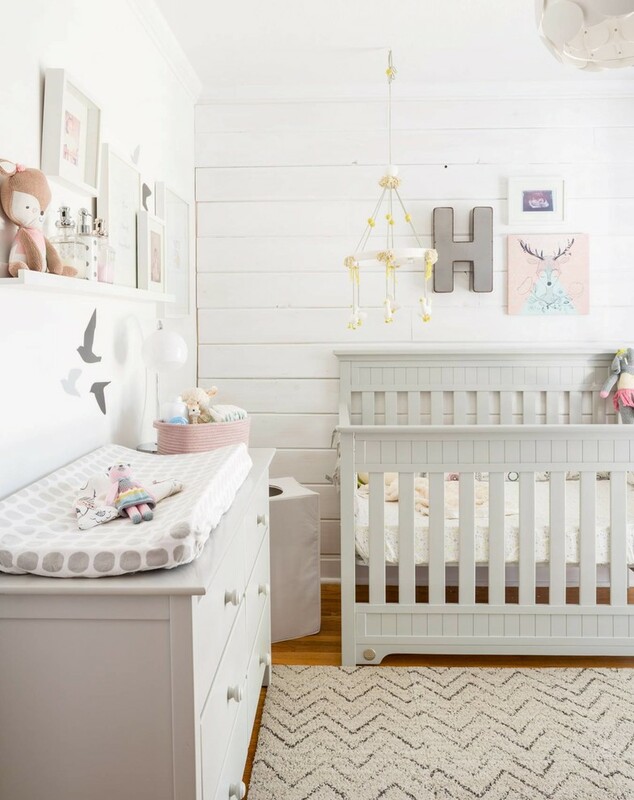 Like other common beach-style interior ideas, white and light grey work optimally for a clean line and fresh beach style nursery. 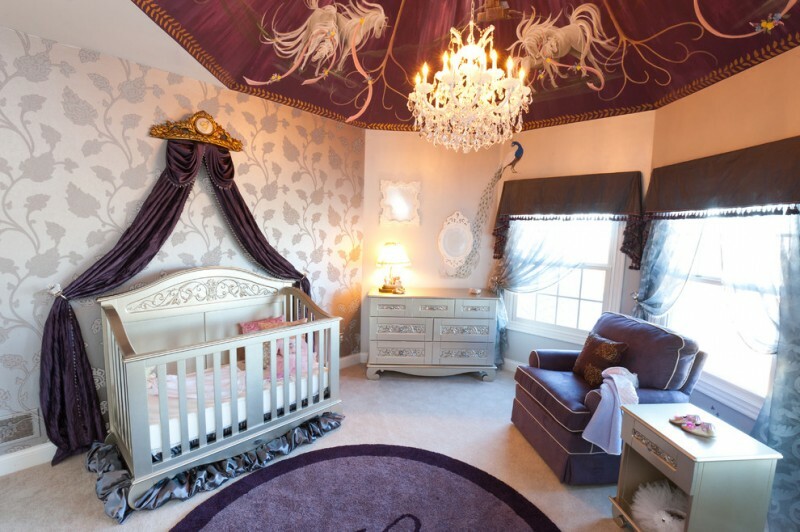 Royal and pretty with ultimate glamour – the words depicting this baby nursery. 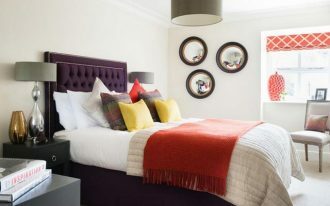 With luxurious purple and grey, they act like the striking accent colors dominating the space. 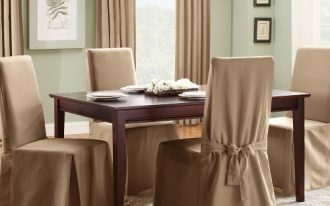 Their glossy effect makes the space more shining as if all fabrics are made of best silks. Medium-sized purple rug is precisely placed on center for a direct focal point. What a marvelous idea! 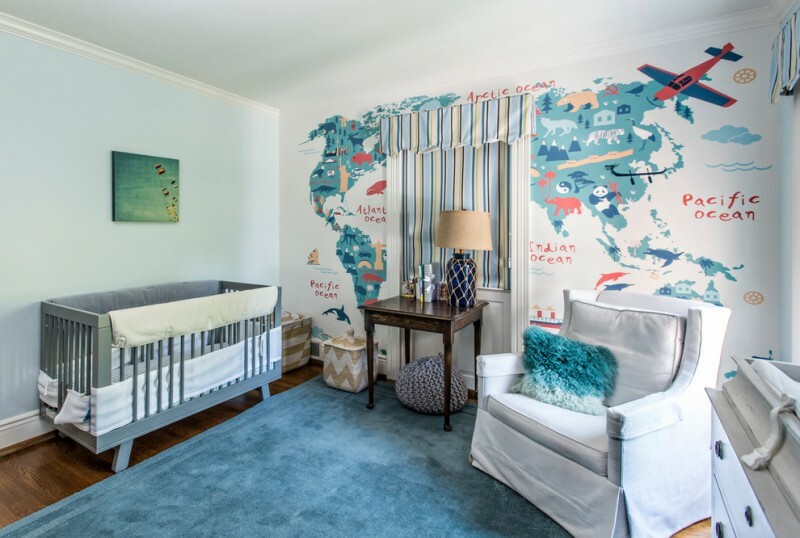 Fully covered with fantasy painting on wall – it’s a great idea to stimulate the baby’s visual skill, but the one that significantly takes most our interest is the fabrics, including rug. Centered round rug in white is perfect, particularly if we want to get cutest animal prints on it. 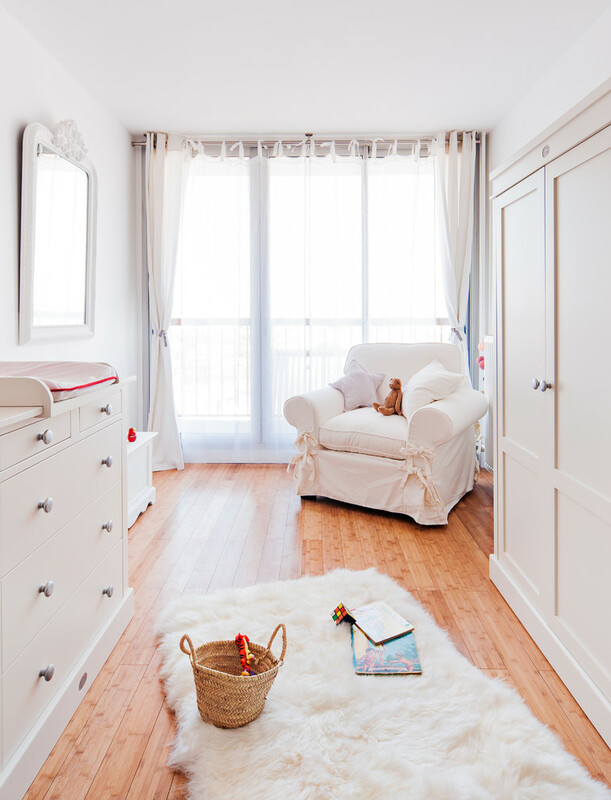 Warm and fluffy white rug is the best choice for such a new baby girl’s nursery. 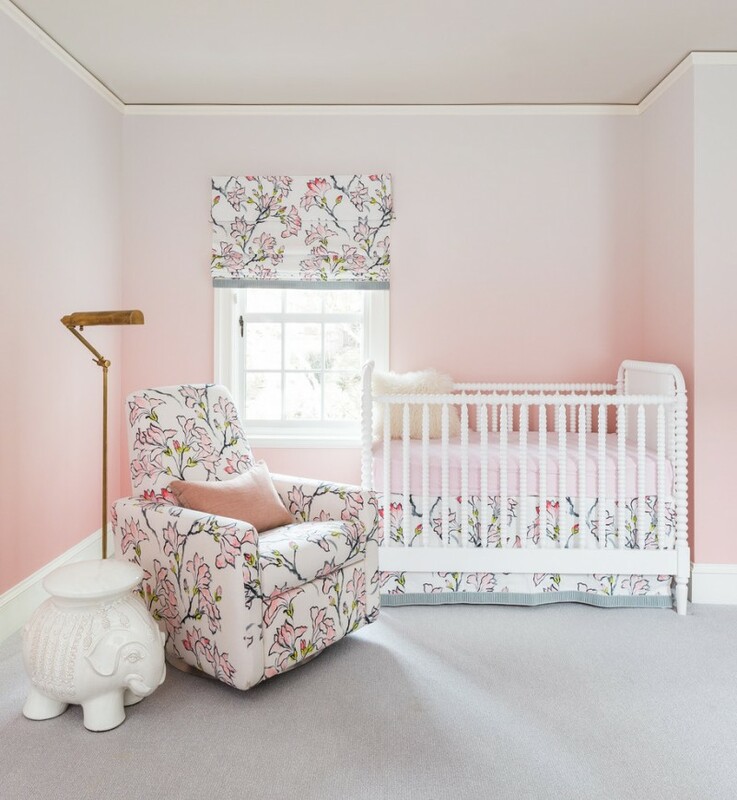 It perfectly blends with baby pink color discovered on round crib’s skirt, mini mattress on changing table, and nursery chairs. 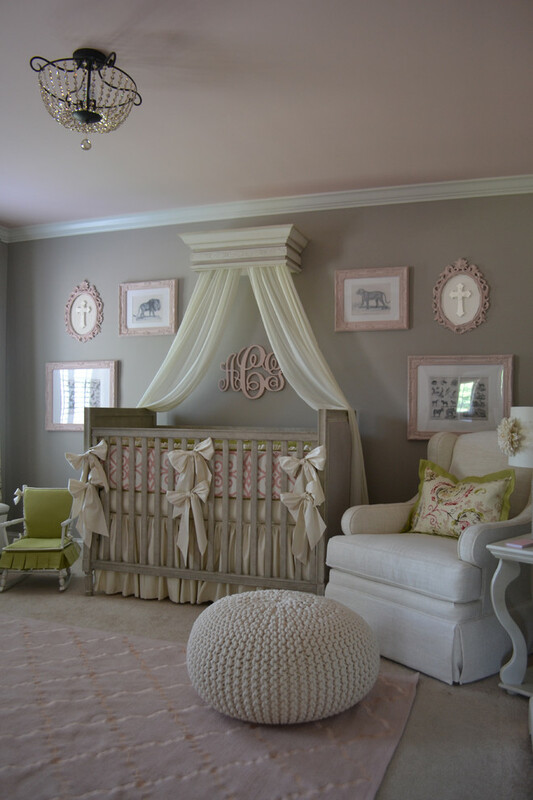 The cutest and coziest baby nursery idea with soft grey, baby pink, and light beige color applications. All colors balance each other; no minor no major one. This baby nursery is inspired from a country side in Britain. The client dreams on soft colors and warm lighting, giving this space an elegant and peaceful feel. 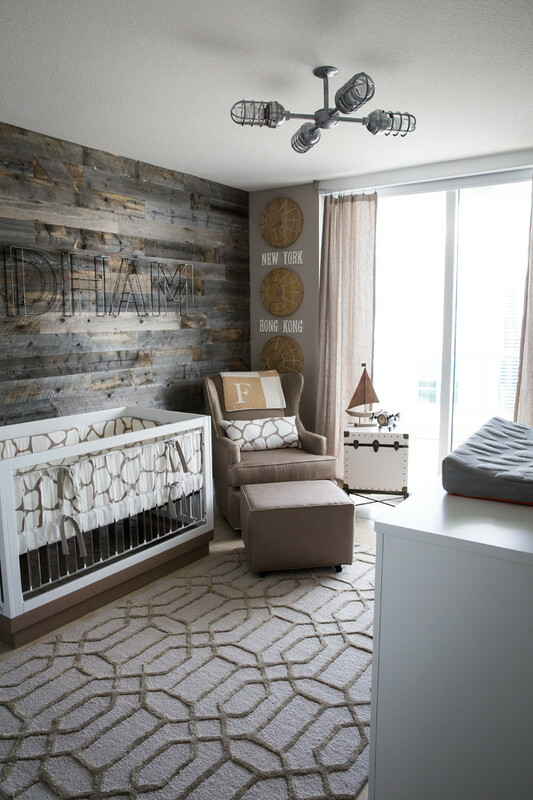 Chic nursery idea with little rustic appeal. There are two layers of rug that cover the floors up. Their contrasting colors are highlighted, adding tone value, especially for nursery’s base/ floor. 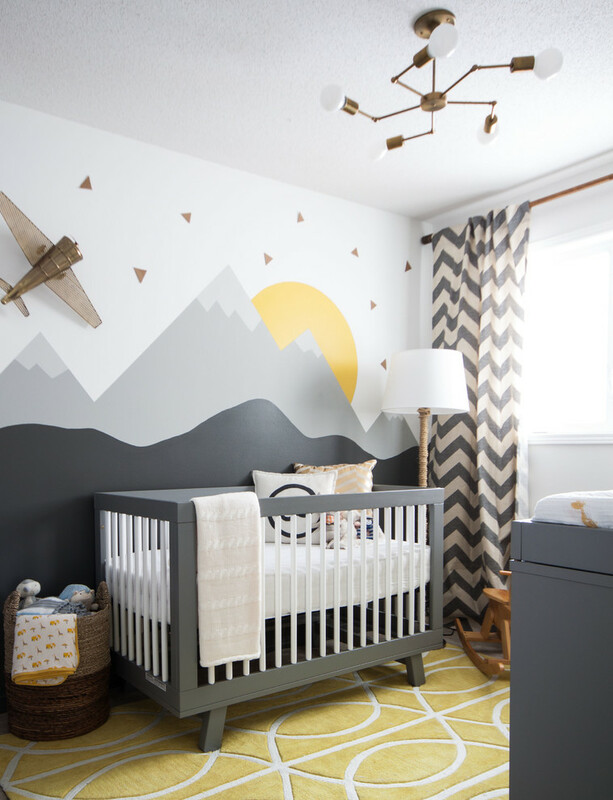 This is called a cottage chic nursery idea for gender-neutral. Look at the rug; it’s so awesome; use ethnic/ tribal patterns as the highlights. All rug’s colors blend well with all wood furniture. 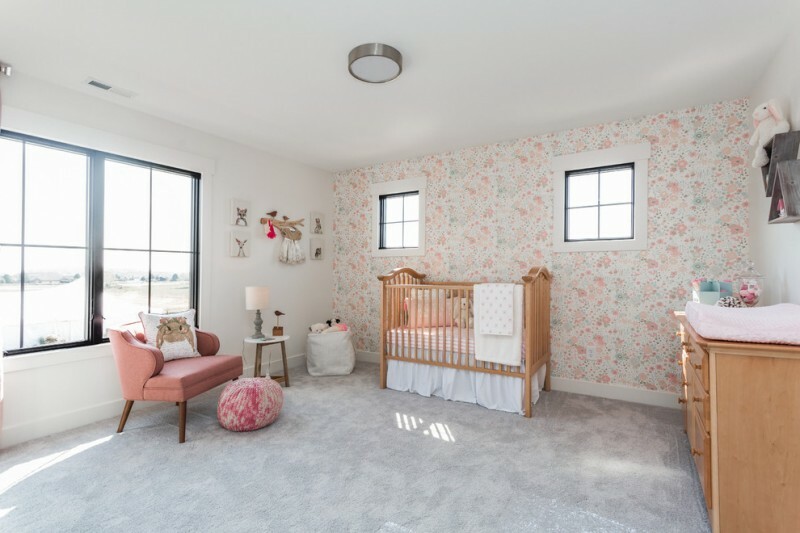 Baby girls’ nursery with shabby chic rug – Feminine values are exposed here, especially on rug and small chair with baby pink finishing. Black is included to add something bold and powerful in the middle of light color tones. Again! Baby pink scheme for nursery. Rug and round-shaped cotton pouf have same patterns and colors, making them dominant at base. Most interior designers would agree that series of light color tones (white and baby blue are included) should be the best complementary hues for baby pink. Feel relax and fun when feeding the baby with such a marvelous nursery space. Baby blue rug here helps you getting clean, fresh, and airy look. And, light-colored floral motifs are classic but blend very well with the interior. 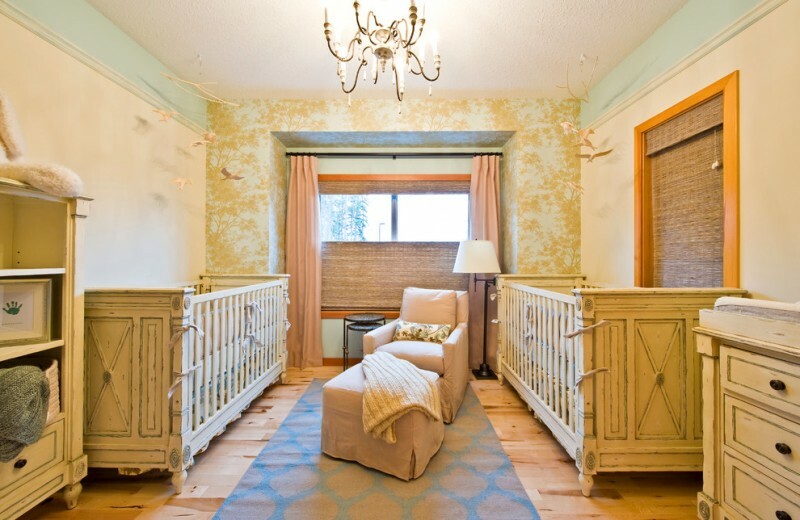 Glowing nursery for twins. If you notice carefully, the rug is out of concept. The client dreams a large and modern rustic nursery for the twins; we’ve discovered dark blue as the basic hue and light brown as the accents. 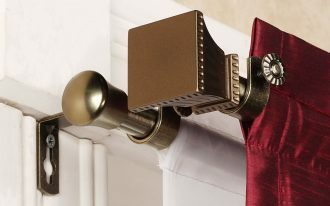 Other items, by contrast, are dominated by natural wood color, but not the wallpaper and window curtains. Asymmetric rug is also well-considered for style. Warm and fluffy are other values you should have when shopping baby nursery rug. Color isn’t really crucial but it turns to be very crucial when you get multi colors in space like this nursery. Neutral is the best choice, and white is the most favorite neutral tone chosen by billions interior design lovers. 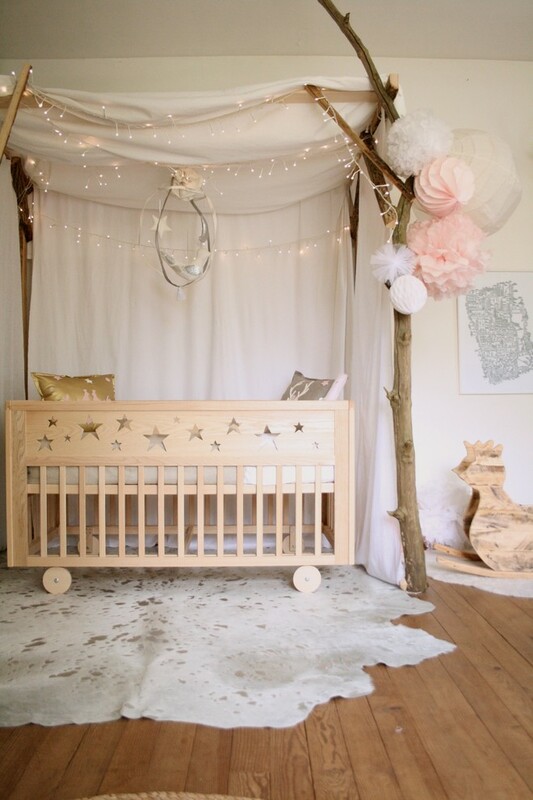 It’s a great idea to use cowhide rug for covering up your baby nursery. To get more powerful natural feel, feature it with all wood interior including crib, accessories, and even floors. This is so perfect and adorable. 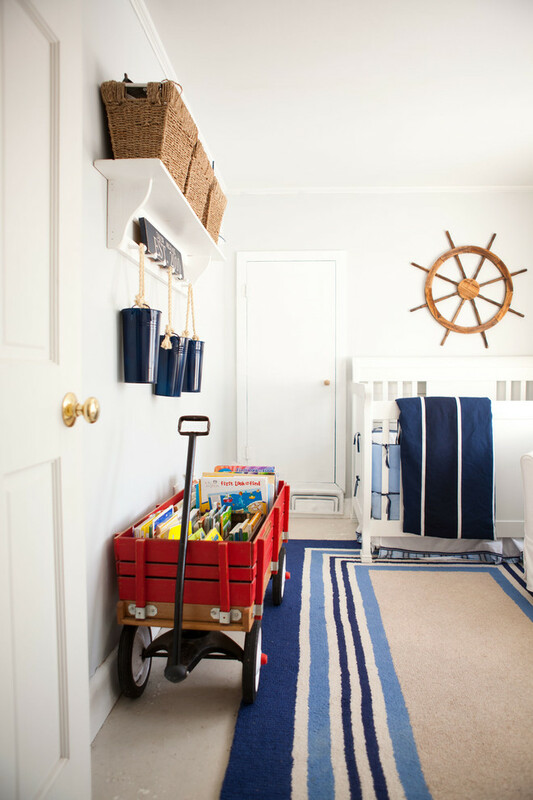 The nursery space has double-layered rugs and decorative kids’ tent as the beautifiers. 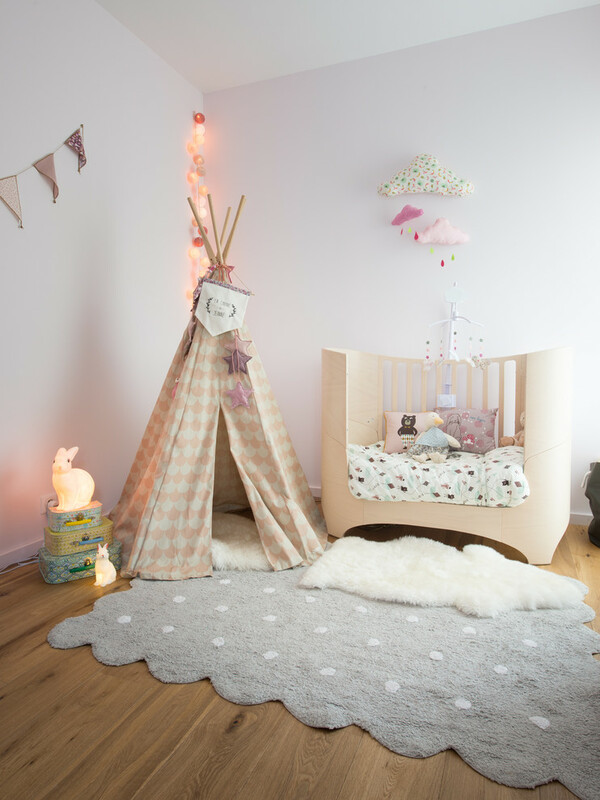 The smaller rug is placed nearest the crib for a comfort, while the larger one is fabric covering floors along the tent’s base and surround. 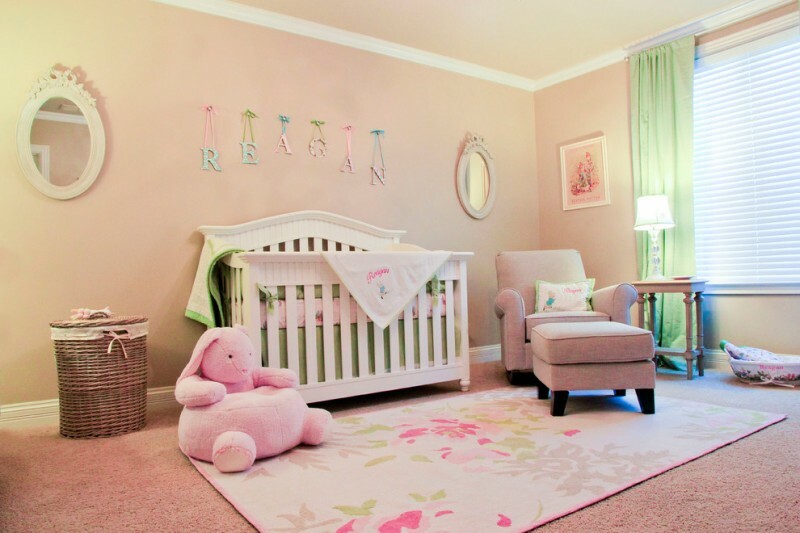 Soft neutral will work perfectly for a neutral-gender nursery. 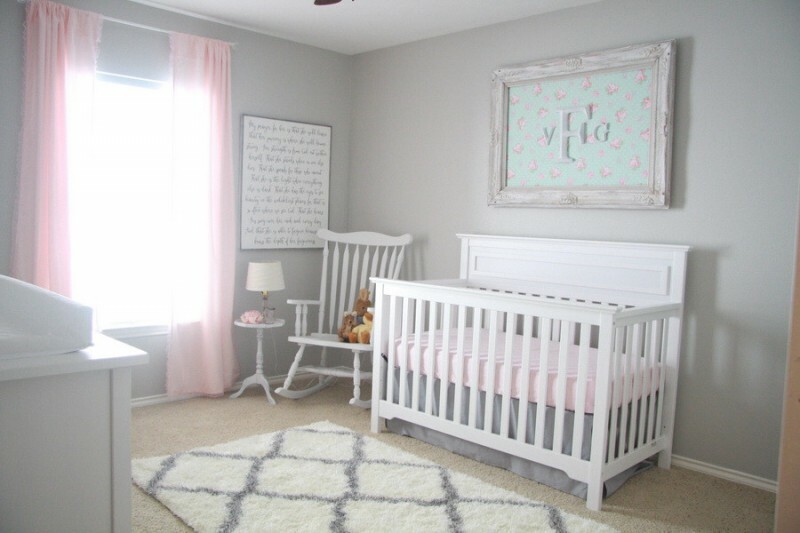 Use soft grey and white as the primary hues, and you can add just a little another color to your nursery space. Turquoise frame, for example, is important to give a new tone variation in this space. Colorful rug colorizes white-facade nursery. The designer just adds some fabrics as the wall decorations and vintage-look crib and side table as the primary interior properties. Many designers say this is bohemian nursery idea. An eclectic urban nursery idea – It exposes shabby but cool with white walls as the background for soft interior properties (but not the crib). Light peach rug has obviously been the coziest one for moms as it gives fluffy and gentle to moms’ steps. Moms don’t need to worry anymore during carrying baby on while singing her baby a lullaby. Chic but not shabby. 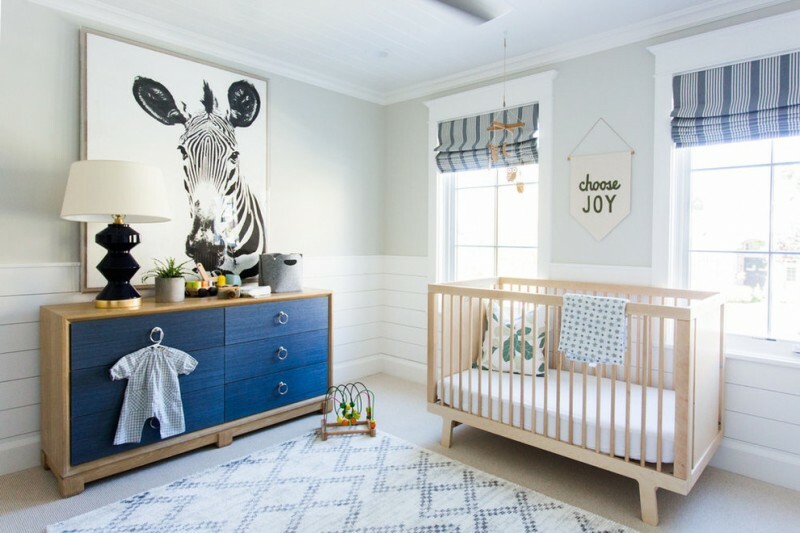 The nursery has been complemented with more varied-style properties like vintage-style iron crib, mid-century modern rocking chair, and traditional case piles as the decoration. Baby peach rug offers warm and cozy feelings. 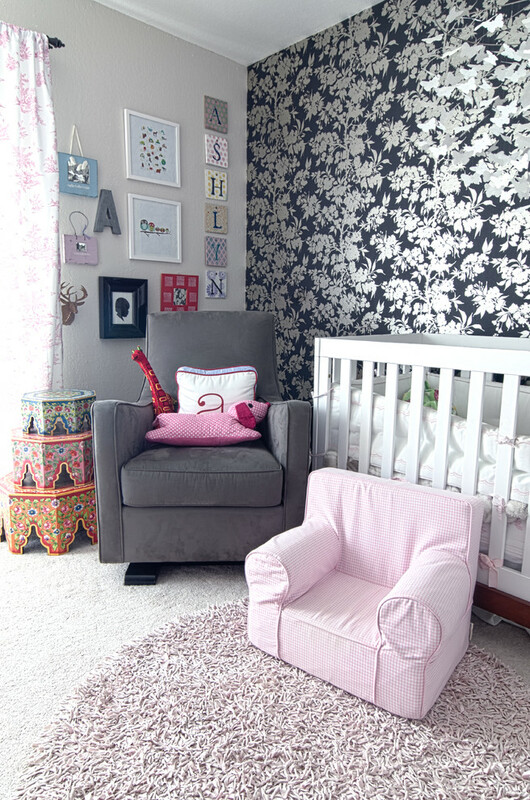 Dark peach and baby pink are the primary colors in this cutest nursery. Baby pink on rug brings sweet feel, matching for a baby girl nursery, and silky white crib’s skirt gives a dramatic effect when it slips over the rug. White and grey are claimed as vintage colors. White fluffy rug with grey line accents are another output of vintage style. It’s just given little modern appeal on patterns used. 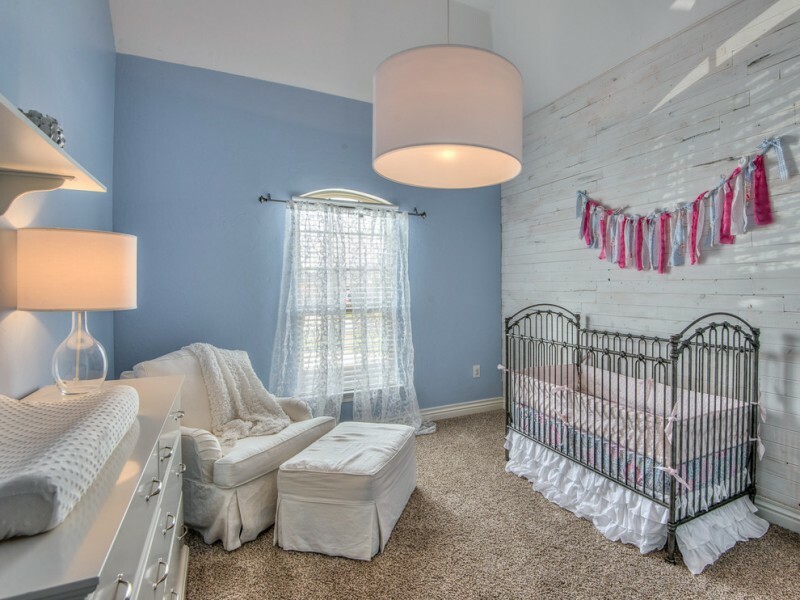 Country style nursery for neutral-gender. Light green is still fresh and stunning. The color looks great when being paired with series of striking color tones like white and blue as what you’re finding on this cute rug. Concrete-look-like area rug idea for a country style nursery room. It obviously contrasts with flower wallpapers and bold furniture sets (such as wood crib with white fabric skirt, wood changing table with drawer system, and bold peach nursery chair). A pair of interior windows exactly beautifies the wallpapers. Just focus on rug; the patterns are modern and finished in white and little dark tone for the accents. Feature such rug idea with white furniture and walls. Wood floors may be added to create warm feel at base. You may use smaller kids’ rug layered on primary rug for a maximum warmth and style. 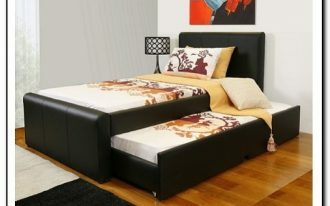 Put some animal stuffs and toys as the accessories and use this space for big sissy/ bro who wants to be mom’s companion. Cotton rug idea with gentle texture and neutral colors. It’s gonna work well with wood floors (that creates a beautiful contrast) and interior items with grey and white finishing (adapted from rug’s primary color tones). Curtains and rug has different color and motifs, but yes they’re beautiful pair. Their opposing look has enriched the space. 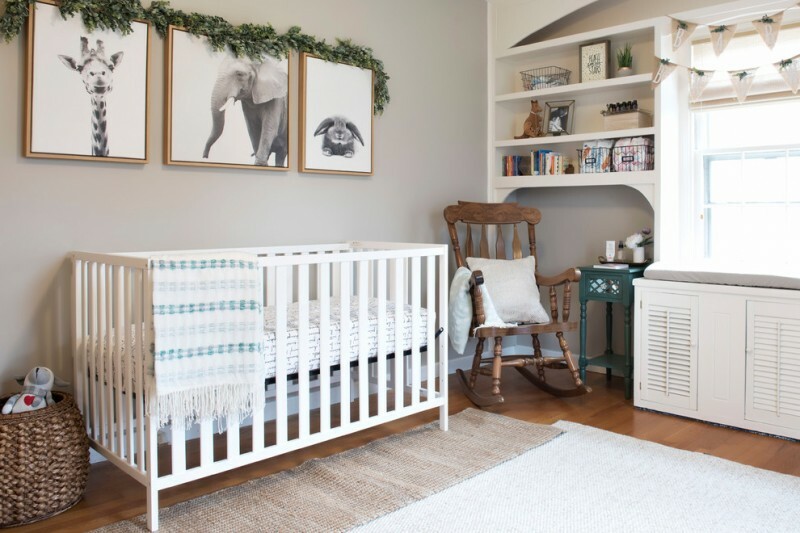 A simple nursery with clean line look. Small-sized, white, and fluffy rug significantly accents the wood floors. White is chosen for a harmonious interior decoration. Scandinavian style nursery idea. White and gentle-textured rug adds cozy feel. Its black lines ornaments give modern appeal to this space. Earthy brown rug makes a distressed look, especially after being paired with two different tones of walls: old and shabby white boards walls and clean blue walls accented with an interior window. 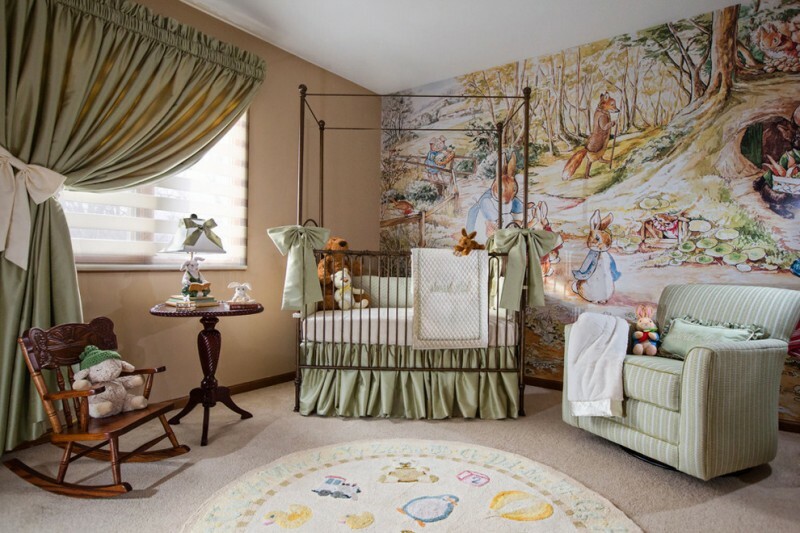 Chair’s slipcover and crib’s skirt also create a dramatic look. 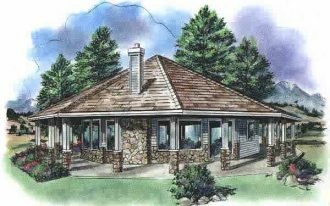 A country nursery for cottage house. The space is a mix of traditional and modern designs, an ideal choice for moms loving traditional concept with a little modern appeal. Double layers rug idea for a baby boy’s nursery. The space is inspired from a farmhouse interior design that exposes more the beauty of country-side values like chair slipcover, scarf-look rug, and conventional ceiling fan. Use pop colors for a fun and modern nursery. Apply single color or color combination for particular items desiring to be series of direct accents. Yellow rug with white line ornaments are just an example of pop color application in right proportion. It’s powerful yet not dominant. Blue rug with velvet – its softness gives relax and warmth, the crucial values most needed for babies’ room. The color is optional, just suit it with best matched color tones. Asymmetric modern rug in grey still shows its softness among dominant white furniture sets. This is an evidence that as soft-neutral color, grey always fits white finishing. 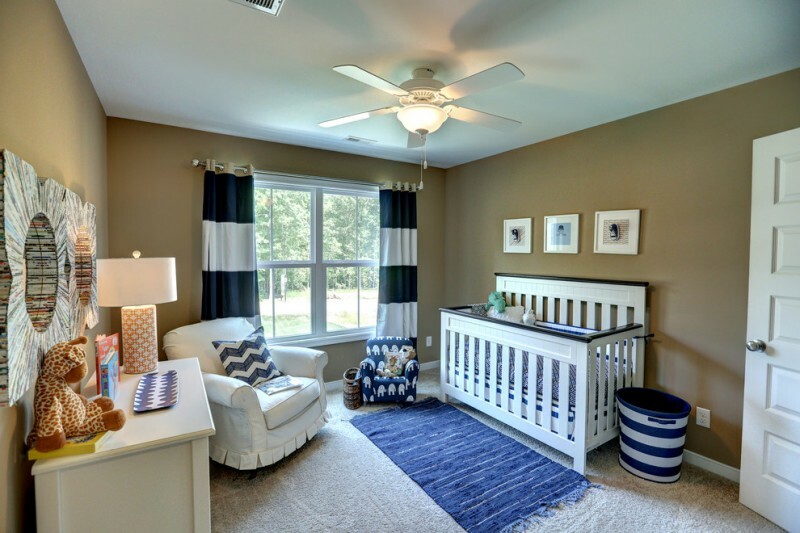 Medium sized nursery rug – Blue, the color accent, has evidently enriched the space where white visually dominates this space. 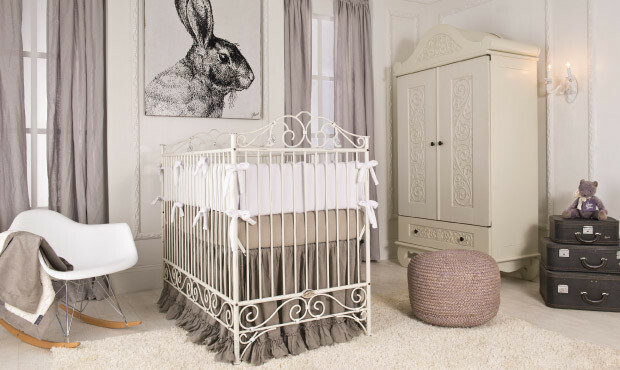 Fill your nursery with ivory and light wood color tones that could create an airy and natural feel instantly. Uniquely, both reflect opposing characters (ivory for cold and wood color for warmth). Create a chic look by including all custom furnishing items and accessories designed in vintage and pop. It could be seen on colors and patterns (including rug). Stripped colors with single one in center – a great choice of nursery rug you may want to adopt. The color choice really stands out. Add the series of functional yet ornate cart for an attractive kids’ bookcase. Clean lines nursery highlighted with stripped rug. It’s interesting idea to put patterns on plain base like this dark-toned wood floors. It gives special look and gets rid monotone off. Rug and crib’s cover are similar in fabric, pattern, and tone. If you have the interest on something textured and soft colored, this rug is the most recommended one. All beneficial values are in this rug product. It’s warming, cozy making, and gentle-texture feeling. The color is also calm and could be a relaxing floor cover.